How does a totally Italian ‘olive oil immersion’ program consisting of picking olives in the Italian countryside; learning about olive oil production using traditional methods and Italian cooking first-hand; and visiting local ancient villages sound to you? 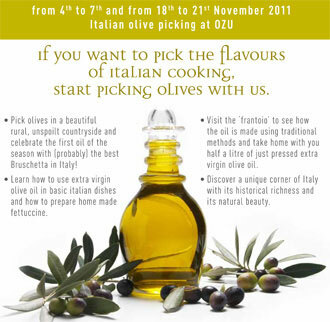 Two such weekends promoting Italian olive oil culture are being offered by OZU this November. Get out your calendar and start rolling up your sleeves! Founded in 2005, OZU is a vibrant cultural and art center located in the heart of the Sabina region of Italy, just 55 km from the city of Rome, in a former candy factory. Throughout the year, OZU hosts artistic residencies and all sorts of activities and events including photography, ceramic, sculpture, yoga, theatre and dance workshops as well as cinema, music, food, and theatre festivals, promoting local culture for visitors and international culture for locals. The OZU olive picking weekends are November 4-7 and 18-21, 2011. You can stay from Friday to Monday or Friday to Sunday. For more information, please see OZU website, write to info@ozu.it, or call +39 0765 885027. OZU inspired a UK-based cultural agency that offers a range of support such as training, project management, strategic planning, organizational development, research, feasibility studies and evaluations to name itself Olivearte. "The name of our agency links the culturally symbolic nature of olive oil and creativity, the oil that has fueled our most civilizing developments. It represents both our practical and idealistic attitude to culture and the work we do. We like the idea of growing things, be it food, ideas, artistic projects or visions for the future,” said founders Sandy Fitzgerald and Paul Bogen. The olive picking weekends at OZU are recommended by www.olivepicking.com, another great organization in Europe. We thought you might be interested in reading more about these three cultural agencies and - even more - participating in one of the OZU Olive Picking Weekends!